Wondering when is the best time to buy airline tickets? Just like other industries, there are best times to shop with airlines in terms of both how far in advance to shop for tickets and what days of the week to plan your trip. Sometimes different days of the week or times of the year are better for travel than others. Planning ahead is always advisable. 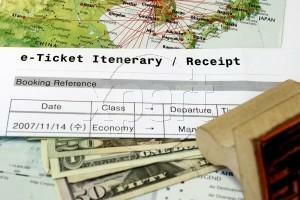 Use the following tips when you need to book airline tickets and you just might find a great deal. Planning far in advance and watching carefully for discount air travel opportunities are the keys to finding the best fares. Far in Advance of Departure: The best time to find good prices on airline tickets is far in advance of the time that you need to travel. Prices start out at the low end of the spectrum, then increase as seat availability starts to become scarce. Look for seats a few months in advance of a scheduled trip as long as you don't foresee any reason that your travel plans will change. To avoid paying high rates due to low availability, it's essential to purchase at least 21 days out, as that is when prices tend to increase sharply. When Special Offers Are Announced: Sign up to receive e-newsletters from the airlines that you use most frequently and you'll be among the first to find out when special fares are offered. Unfortunately, there's not a specific pattern to when good deals are announced; it's up to you to watch for special offers and react quickly. After all, it's in the airlines' best interest to keep passengers guessing so that flyers don't end up postponing making plans until times that deeply discounted fares can be expected to be announced. If you can be flexible with your departure and return dates, you can save quite a bit by planning your travel times carefully. Slow Business Travel Days: A great deal of air travel volume occurs when business travelers are on-the-go and on peak holiday travel days. Select travel days that tend to be relatively light. For example, a significant percentage of business travelers head home for the weekend on Fridays or choose to save money by taking advantage of Saturday night stay over rates. For this reason, Saturdays tend to be among the least popular days for business travelers, so you can sometimes get the best rates then. Off-Peak Seasons and Times: Avoid traveling during the times that people are willing to pay premium prices. For example, if you need to fly home for Thanksgiving, don't book your trip for the Wednesday before turkey day. Take a few vacation days and leave early. Or, agree to celebrate Thanksgiving with your family on Friday and book your airline tickets on Thanksgiving Day -- a time that many people aren't likely to be flying. If you want to visit a particular destination, don't go during the busy season. For example, tickets to Charleston during the Spoletto music festival or to New Orleans just before the Sugar Bowl are likely to be at peak prices. You can also find great deals by checking online resources like Priceline, Farefox and Kayak for bargains. Consider using these resources if you are planning ahead or if you find yourself in a situation of having to book travel within a few weeks or days of flying. While you'll still get the best deal if you book your tickets when seat inventory is plentiful, you may be able to save more through one of these sites than going directly to the airline if you don't have that option.